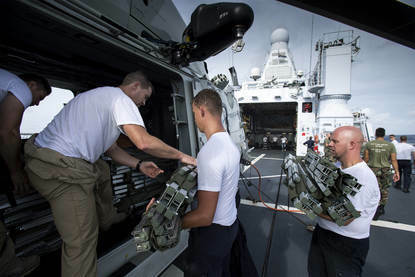 The offshore patrol vessel HNLMS Zeeland will provide emergency relief on the island of Dominica. Like St Maarten, Dominica is part of the Leeward Islands in the Caribbean. The operation comes in response to the request for help issued by the Dominican authorities after hurricane Maria caused enormous destruction on the island on Monday. The NH90 military helicopter on the deck of HNLMS Zeeland, being stocked with supplies for St Maarten. The Zeeland will carry out a range of tasks, such as surveying the damage on Dominica, carrying out medical evacuations and delivering relief goods. Its NH90 frigate helicopter has already carried out an initial reconnaissance mission, picking up 4 wounded, 2 of whom have severe injuries, at the airport and transferring them immediately to hospital. In the days to come, the Zeeland will conduct more reconnaissance missions in order to offer help where it is needed. Before being deployed to Dominica, the Zeeland was actively involved in the relief operation in St Maarten. It was one of the first vessels on location after hurricane Irma struck the island. The relief operation in St Maarten continues unabated and is making progress. The Netherlands’ support of Dominica is a demonstration of international solidarity and should help the island deal with the current urgent situation. The operation is being financed from the Foreign Trade and Development Cooperation budget. Hurricane Maria had intensified to a category 5 storm, the highest level, when it made landfall on Dominica on Monday, leaving a trail of destruction. Hundreds of households are without power and communications equipment has failed. The first aerial photos taken of the island show that around 95% of the buildings have lost all or part of their roof. At least 15 people have been killed. Dominica has a population of 73,000 and is one of the poorest countries in the Caribbean.